ISLAMABAD: President-elect Dr Arif Alvi will take oath of the office today as Mamnoon Hussain completed his five-year tenure as the president of Pakistan on Saturday. The Chief Justice of Pakistan, Justice Mian Saqib Nisar, will administer the oath to him. 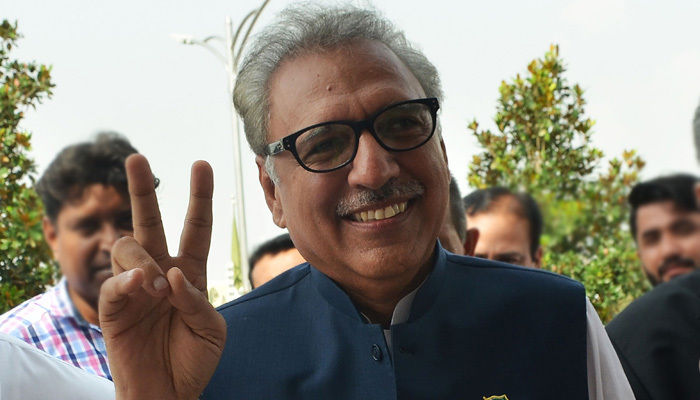 Dr Arif Alvi, one of the founding members of ruling Pakistan Tehreek-e-Insaf and a close aide of Prime Minister Imran Khan, won the 13th presidential elections on September 04 by securing 352 votes in the electoral college of national and provincial assemblies and the Senate. Apart from PM Khan and Chief of the Army Staff (COAS) General Qamar Javed Bajwa, higher political and military authorities will attend the oath-taking ceremony. Ambassadors have also been invited to the ceremony. According to the spokesperson of Presidency, guests will be served with tea and biscuits at the ceremony. Mamnoon Hussain was given a farewell guard of honour by a smartly turned out contingent of the armed forces. The outgoing president inspected the guard of honour. He also held a farewell meeting with the staff of the Presidency. After inspecting the farewell guard of honour, Mamnoon Hussain, along with his wife Mehmooda Mamnoon Hussain and other family members left the Aiwan-e-Sadr. Dr. Arif Alvi is a politician, dentist and a parliamentarian. He is a founding member of Pakistan Tehreek-e-Insaf and was the Secretary-General of the party from 2006 till 2013. Dr. Arif Alvi had previously contested the 1997 general elections as a provincial assembly candidate from DHA area and then later again in the 2002 general elections as a National Assembly candidate. In 2013 he was elected as a Member of the National Assembly of Pakistan from Constituency NA-250 Karachi. His father Dr. Habib ur Rehman Elahi Alvi who practiced dentistry in India migrated to Pakistan in 1947 and opened a dental practice in Saddar, Karachi. Dr. Elahi Alvi was a dentist to Jawaharlal Nehru and the family has letters from Mr Nehru to Dr Alvi in their possession.